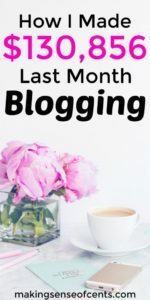 How Much Can you Earn Blogging? First I would go to Google and type in my interest. As you can see from the results there are a variety of different websites here from blogs, to eCommerce sites, to forums. 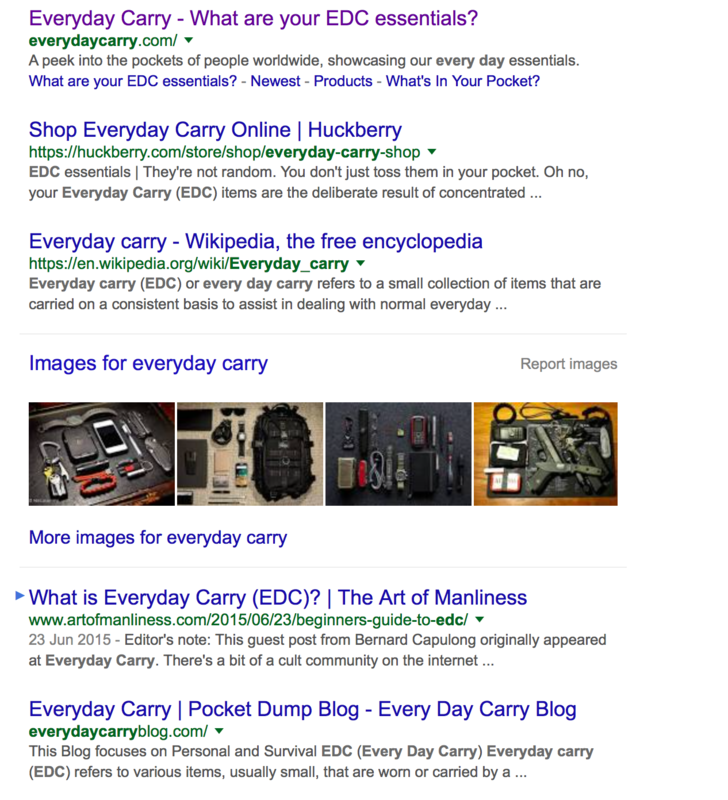 Google also shows there are over 14.7 million websites that mention “everyday carry”. I can also see a sub-reddit here which has almost 75k subscribers. Next let’s have a look at Google Trends to see if it is growing in popularity or declining. As we can see here Google Trends thinks this topic is on the up. Ok so what about traffic. How much would it cost us if we wanted to pay for people to come to our website by Google’s Advertisements and how many people are searching for this stuff. Pop over to the Google Keyword Planner and type in your terms. Google will also suggest other related terms too. Here we can see that Everyday Carry is searched 12k times per month and the cost per click (CPC) tells us that is would cost around $2.50 for someone to come to our site by clicking on a Google Ad. There are lots of paid tools out there which can help you see how much sites are already paying for adverts and this really will help with your initial research. If you want to do this then you can sign up to a free 14 day trial of SEMRush and try this out yourself. 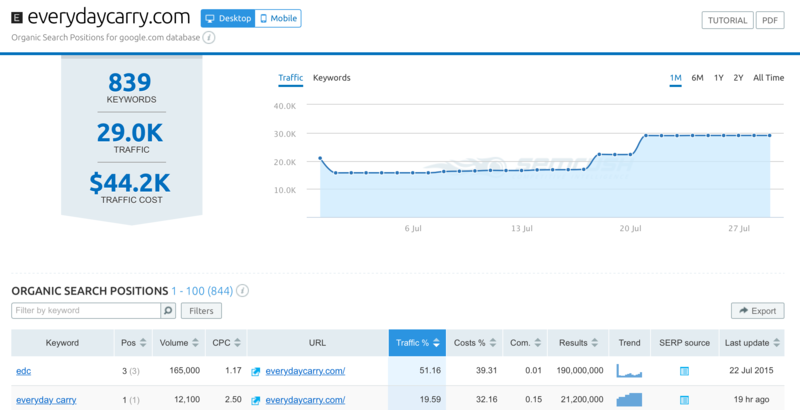 Here we will use SEMRush to see what keywords the website Everydaycarry.com is ranking in Google for. So as we can see from this chart SEMRush thinks that it would cost Everydaycarry.com over $30k per month to get the traffic they are getting for “free” from Google’s organic results. By clicking on the different options we can then see which keywords have the highest search volumes. Overall I would say this was a profitable niche with a growing audience and therefore something worth looking to building a blog around. Of course this is just my own personal interest, you may be a keen amateur photographer, a budding cake decorator or want to write about travelling across Australia. So, carry out your research online by looking at different websites in Google and even on social media sites such as Facebook or Pinterest to see where the money making niches are, where the people are and if these niches are growing or shrinking. It will save a lot of heartache later down the line. Are you still with me? That’s a lot to take in if you haven’t done this before. Now that you have done your research and worked out what niche you want to enter it is time to start bringing all of the different elements together for starting and monetizing a blog. So now that you have built your blog you are ready to create some blog posts for your readers. I have created a guide to coming up with interesting blog post ideas which may help you here and this post covers some tips to writing great blog posts. I started my first ever blog by writing on a consistent schedule about myself, my hobbies and interests. People found me via Google, Facebook, social media and my readership gradually grew over time to where it is today. Once I had built up an audience, making money from blogging became an afterthought. When you have a large group of fans interested in what you have to say, the money will come. Trust me on that. The hard part is finding and gathering your fans. No matter how great your articles are no one is going to know about them unless you take time to promote your blog. P.S. SEO is not dead, it’s one of the best traffic sources for people who will buy your products/services or sign up to your email lists. SEO is a lot harder than it once was but don’t ignore it. The results will vary depending on your target audience. If your blog is aimed around professional readers and business people you might have more potential traffic from LinkedIn and Google+. If your target reader is more visual it might make more sense to focus exclusively on Facebook, Pinterest and Instagram for promoting your blog. A great social media management tool for all this is Sendible. Try it for free for 30 days or check out my review on Sendible. Those are six popular sharing buttons. There are many more. Whichever you choose make sure you limit the number of icons that appear and also make sure the plugin doesn’t slow down your page speed dramatically. If it does you’ll lose readers. As is with most things in life, sometimes the best approach is somewhere in the middle. With paid methods, you have the opportunity to pay for traffic and clicks right away. And if you do well in targeting your audience on the right channels you can easily build your audience with advertising to supplement your organic efforts. Twitter – has a variety of ad options like Facebook and other social networks. The best one for your blog marketing efforts is the Promoted Tweets option. You can expect about $0.50 to $0.75 estimated cost per engagement, which is Twitter’s way of telling you what your cost per click is. Reddit – ads appear on the top of the various pages. They are obviously ads so users don’t feel tricked into clicking on them. When people choose to select an ad they usually know it. So there is little chance of upsetting customers this way. LinkedIn – has traditional online advertising that appears in the sidebar, but the Sponsored Updates options is much more advantageous for content producers. You will see lots of bloggers who proclaim that the money is in the list. In my early days I didn’t buy in to this ideology but now it’s one of the most important things I focus on. Once you’ve developed your fan base, it is essential to retain them as you continue to build your personal brand. In the case of my blog, about 99% of my early readers would come, read a single article, and then leave forever. So instead of missing out on a potential regular, I started gathering email addresses using a service called Awebber, but these days I prefer GetResponse. In return for a reader’s email address, I would give away a free 7 day email course via email. About 85% of the time, that reader would stick around after the mini course to check out my new articles and updates. In fact, I have readers on my blogs that have stuck with me for over 6 years!?! If you are not sure about which list building software to use I have reviewed a variety of email marketing services for you. So now that we have covered the basics of building up your blog and it’s following lets have a look at some different ways you can begin to monetize your blog and start earning. In many cases, affiliate marketing is confused with referral marketing. This is likely the case because both marketing methods involve the use of third parties who drive business to a retailer. If you are planning to become an affiliate marketer then it might be a good idea to sign up to an affiliate network such as Shareasale or ClickBank in order to find offers to promote. If you really have no clue where to start with Affiliate Marketing…. If all this affiliate marketing stuff sound like rocket science to you then I’d suggest you take advantage of some training on how to set up your own passive income generating online affiliate business. For me this affordable course from Michelle Schroeder-Gardner is the only thing your will need to truly understand the art of making money through blogging. It will show you how you can get up and running extremely quickly and with no affiliate marketing experience needed. Cost per click advertising (CPC) are ads that can be displayed on your website that you will be paid for every time someone clicks them. If your blog brings in high traffic levels then displaying Google adverts can be a quick and easy way to make steady revenue. If your blog is good at keeping your users on the pages then these types of ads can work well for driving high conversions, especially with in-post ads. The big advantage of using a Google Adsense is that it takes just minutes to set up and you don’t really need any coding knowledge to implement it within your blog. Similarly to CPC advertising, cost per mile (CPM) ads can bring in good steady income from your blog if you’re piling through large levels of traffic. They are very easy to set up and you really don’t need any knowledge of coding to do so – all you have to do is create an advertising account and add the code to your site; simple. Typically, CPM brings in ridiculously low returns – some ads pay out around $0.10 per thousand impressions, so you will need a lot of traffic to make a decent income. Of course instead of using a third-party to broker your advertising deals it might make more sense financially to work directly with businesses to promote their products. Generally you will need to build up a decent sized following before going down this route. A sponsored post is one way in which to make money from advertisers. With this type of arrangement you may be asked to publish a post that is provided by the advertiser or they may ask you to write a post that mentions them or their product – depending on your following you can expect to receive between $50 and $500 for a sponsored article. There are some complicated rules for bloggers who publish sponsored posts and depending on your country they can differ. The main point is to make sure that you clearly declare when a blog post is an advertisement. Rather than publishing banner ads on your website via Adsense or another 3rd party you can always work with advertisers to setup their banner ads directly. Generally banner ads are paid on a CPM model, which is basically a price per 1000 impressions of their banner on your website. Companies will often look to sponsor influential blogs within their niche. This usually includes having the brand mentioned within the header/sidebar of your website or even having cross-branding across the whole blog. Everyone has a skill that businesses need and offering your time and expertise is a great way to make an income from your blog. Services have the highest profit margins as you are effectively selling your time and not a physical product – however your income is limited to the number of hours you are available for work. Clarity.fm offer this and you can apply to be listed as an ‘expert’ within your niche on their site. In return, you’ll be able to run your consulting phone calls through them, and you even get a widget for your blog. with so many businesses now running blogs their is a huge demand for competent writers and bloggers. By promoting your services on your blog rather than on a freelancing network such as Upwork you can demand a higher rate. You could also offer similar services such as proofreading and editing too. if you are good at illustration or design then there are lots of opportunities to offer your services to businesses or other bloggers. Whether that is creating infographics, logos or photo-editing you can use your blog to demonstrate your skills and pick up new clients. Of course selling your time for money is not the most scalable way to make money online. One of the ways in which to create a business that can scale to your needs is to sell products online. Platforms such as Wix, Shopify, Woocommerce & Etsy have made it cheaper and easier than ever for anyone to create an online store and sell products online. If you don’t want the headaches of dealing with shipping goods and storing them then creating digital goods can be a great way to make money from selling products and taking advantage of scaling your business. Anything from productivity software, to knitting patterns, to recipes or even training courses can be delivered electronically. If you’ve got a really active community within your blog that are looking to learn more about what you’re writing about, then there could be an opportunity to create a paid membership area. This would require members to pay a fee to see extra content on your site (usually learning resources or videos). For example internet marketer Brian Dean runs a successful SEO membership site called SEOThatWorks.com. Which even though it costs nearly $2k to join he has had scores of happy members join. As I mentioned earlier if you looking at offering consulting or training services then it might be worth packaging your materials together into an online course. By offering MP3 or video downloads your students can follow along at their own pace. This is a very popular blog monetisation strategy especially within the online marketing space. There’s loads of up-sell opportunities from offering training courses and it can easily be scaled if it is mainly self-teaching materials. Not only this, but you can start gathering email addresses from your trainees and start marketing new courses to them. Although there is high potential for revenue, it’s not always an option for blog owners that don’t have a lot of time/resources. What’s been your biggest struggle with making money from blogs?